All in all, it’s OK as soft plays go – it’s just not worth the money. 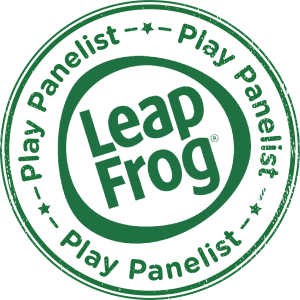 Has potential, is fun for the kids but you don’t get long enough to play and it’s very expensive for what it is. Food was pretty bad. 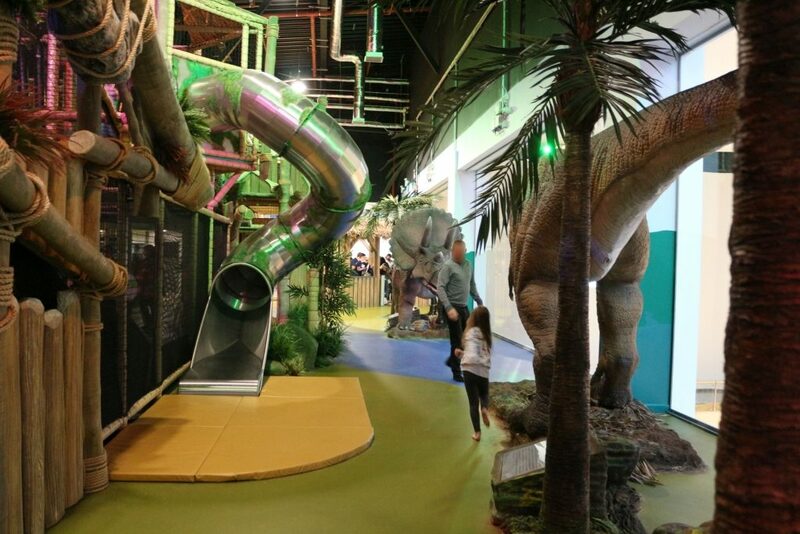 Dinotropolis is a new indoor attraction for children in Bluewater shopping centre, Kent. Situated in the Plaza, next to the Showcase cinema and up a flight of stairs, it’s well hidden to shoppers but when we went on the second Saturday that it had been open, it was already very busy. 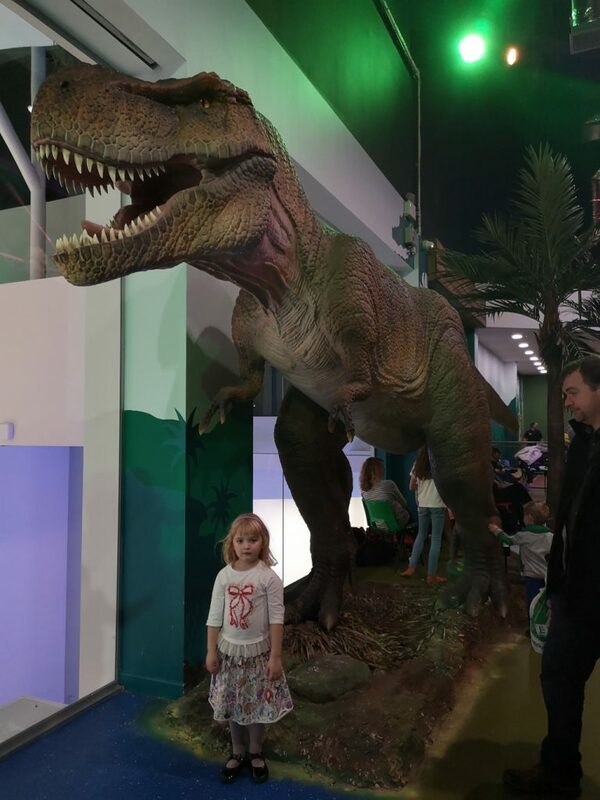 What is there to do at Bluewater’s Dinotropolis? 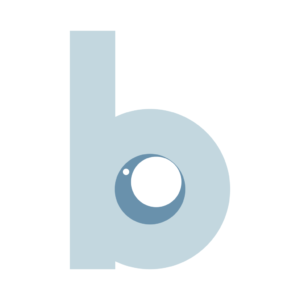 What is it like and is it worth a visit? 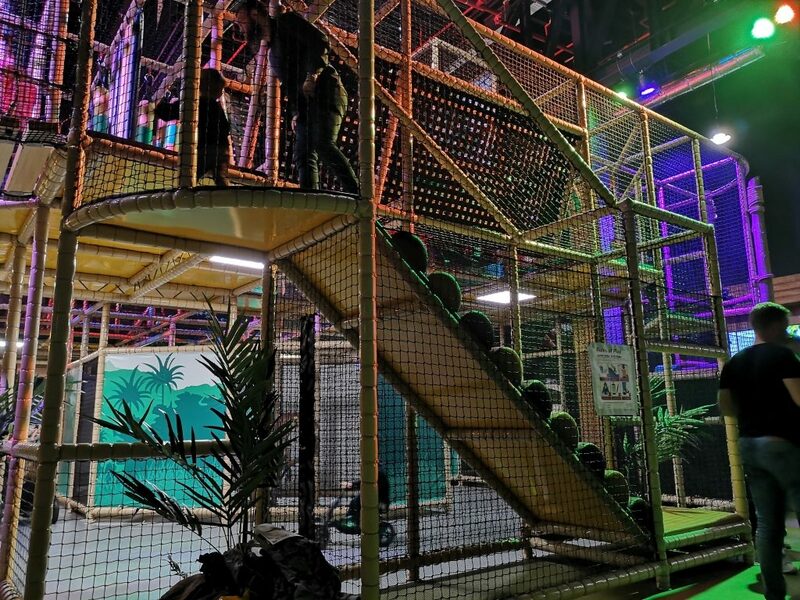 There are three large animatronic dinosaurs on display, with more inside the go-karting arena and lots of dino figures and decor. You can get up close and personal with a life-size triceratops, T-rex and apatosaurus and pose for a selfie if that’s your thing. There’s a sandpit, where budding palaeontologists can dig up dinosaur bones. 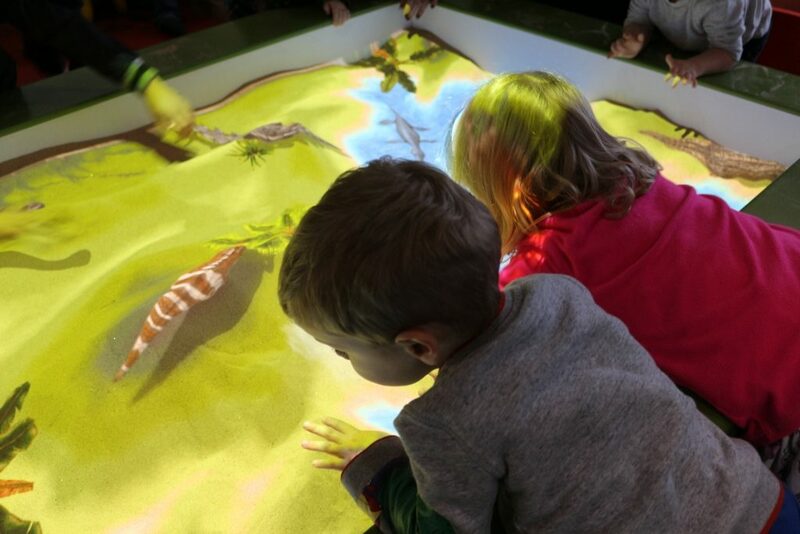 This is fantastic – kids can dig with their hands to create lakes where plesiosaurs will appear, create mountains and even volcanoes while dinosaurs roam the land. Extremely clever stuff, the kids were spellbound! It was quite high up so younger children need to be lifted. Two big dinosaur skeleton 3D jigsaws for slightly older children to put together. 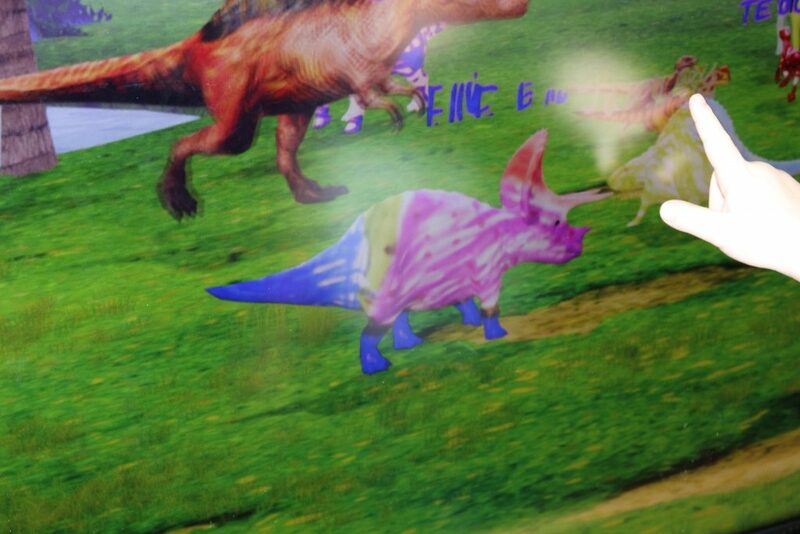 Bring a dinosaur to life on the big screen! 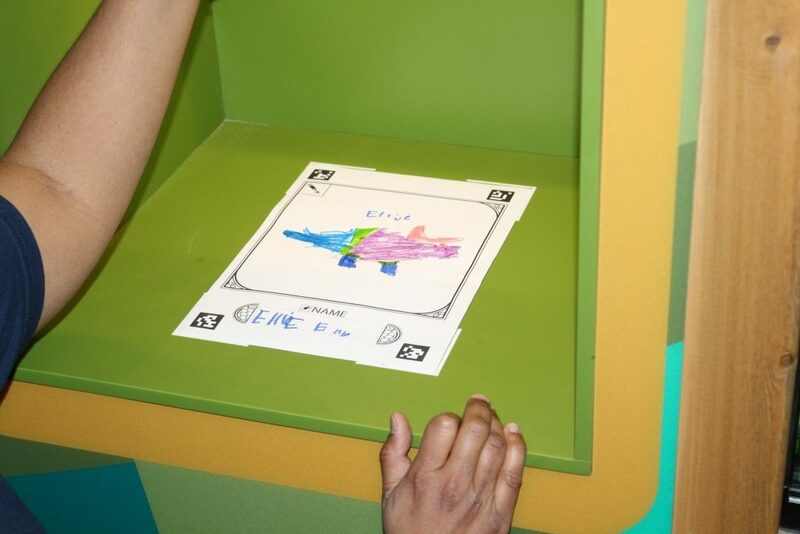 Colour in your dinosaur, write your name on it, and then a staff member will scan it in. It will appear on the TV screen and walk about for a bit. 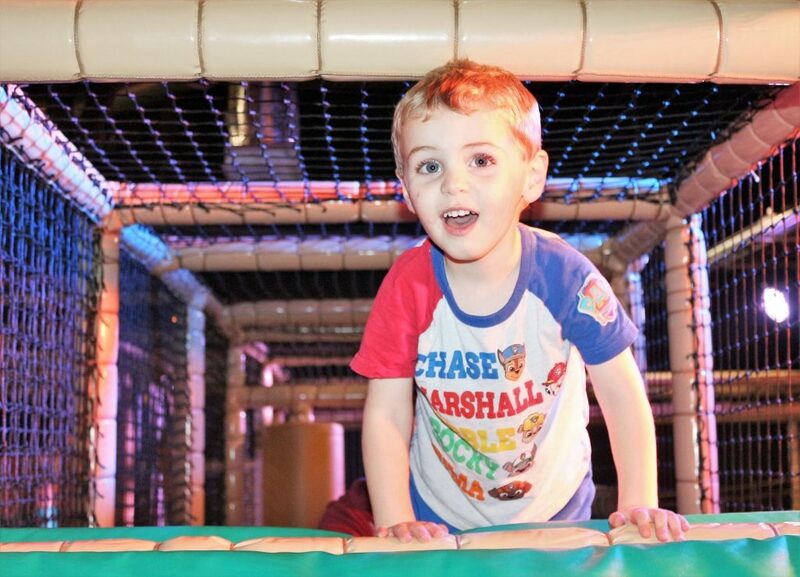 The Dino Jungle is a three storey large soft play, with a smaller toddler sized soft play area for under threes. 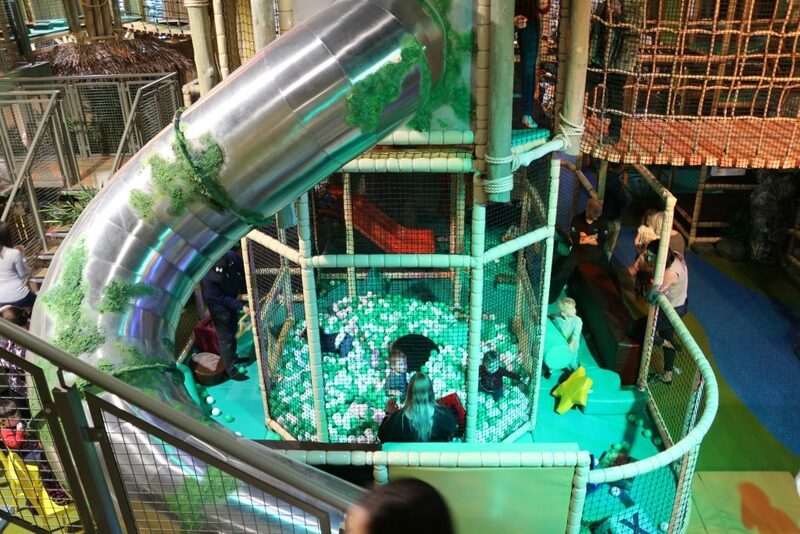 The soft play is the main attraction; it’s large, clean (as it would be; it’s brand new) and a good size for parents to wander in, if you’re into that kind of thing. 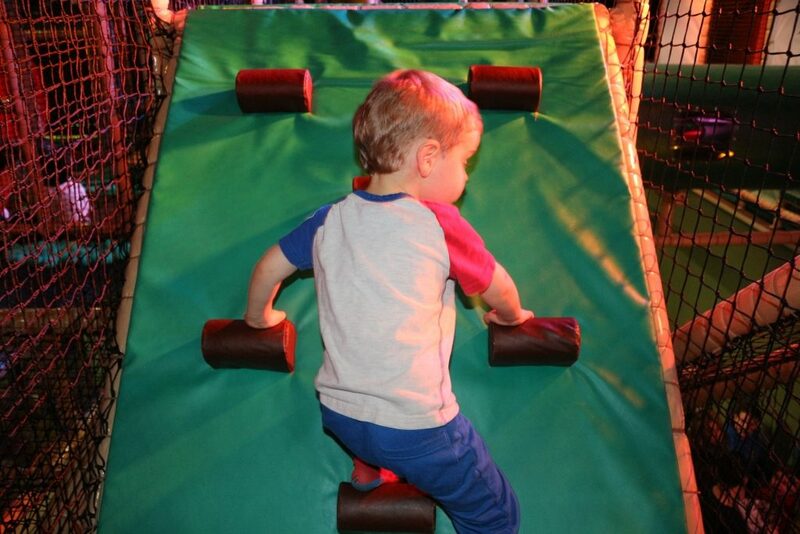 There are various rope bridges, a big slide, padded climbing areas and even a ball-shooting arena which is great fun! 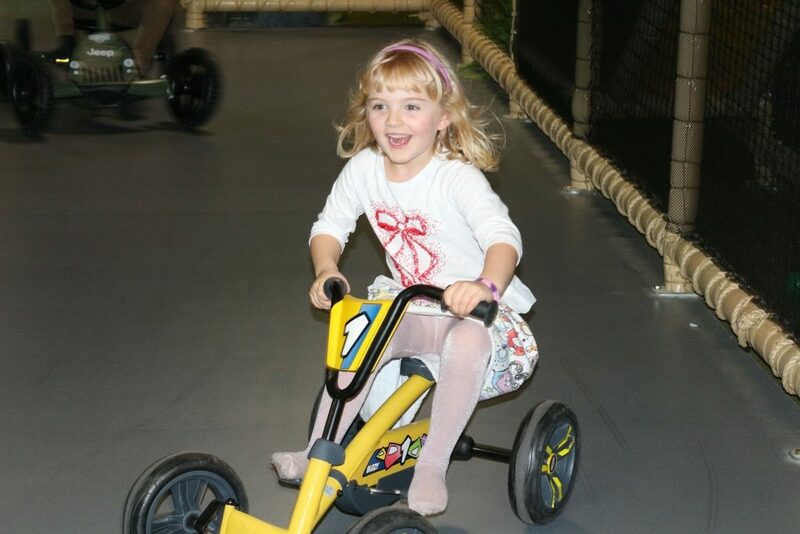 Pedal powered go karts go round a track in the centre of the soft play; this one is for the over 4s. 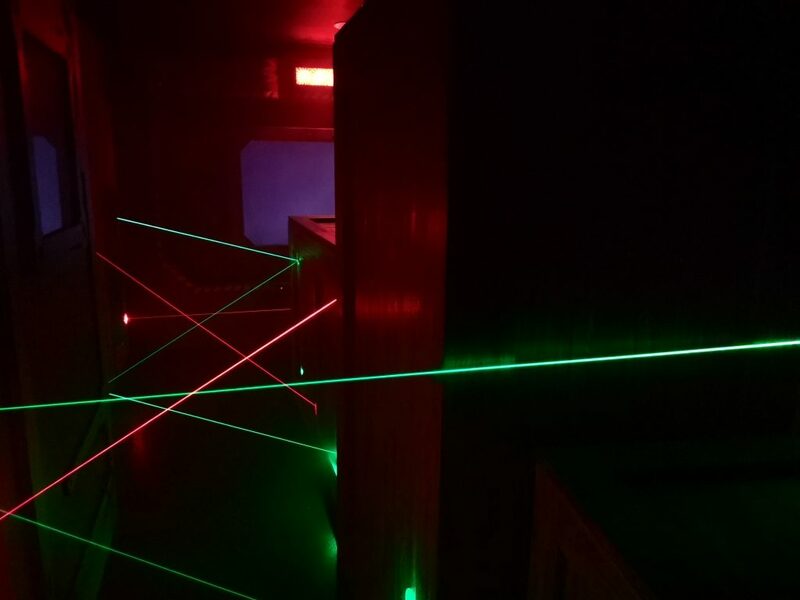 In the escape room, your child needs to get to the other end of the room and press a button without being touched by the ‘lasers’ and waking the sleeping dinosaurs. It’s very dark, and my daughter was not up for it at all after queuing to get in. You can’t take your own food into Dinotropolis, but they do have a cafe with a selection of hot and cold drinks, snacks and a hot food menu which you can find here. What did we think of Dinotropolis? 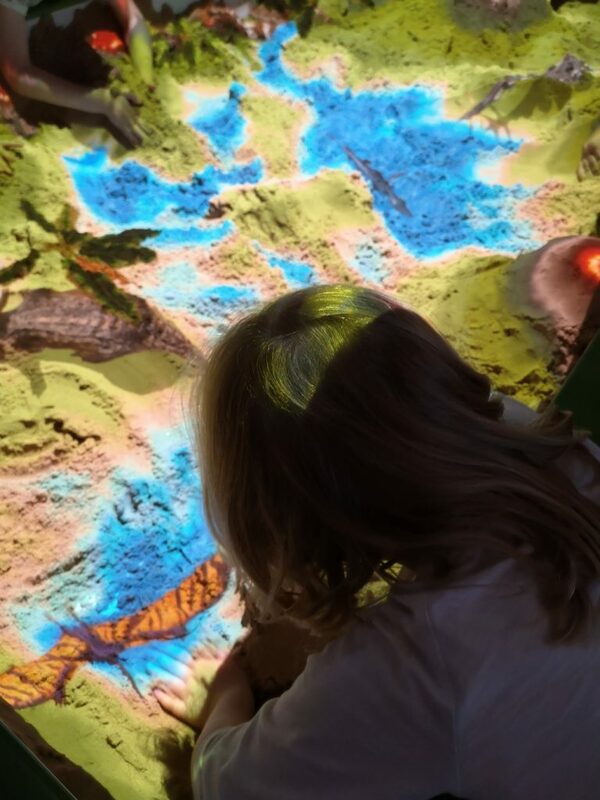 The augmented reality sandpit was definitely the best bit for the kids; they wanted to spend all their time piling up sand to make volcanoes. 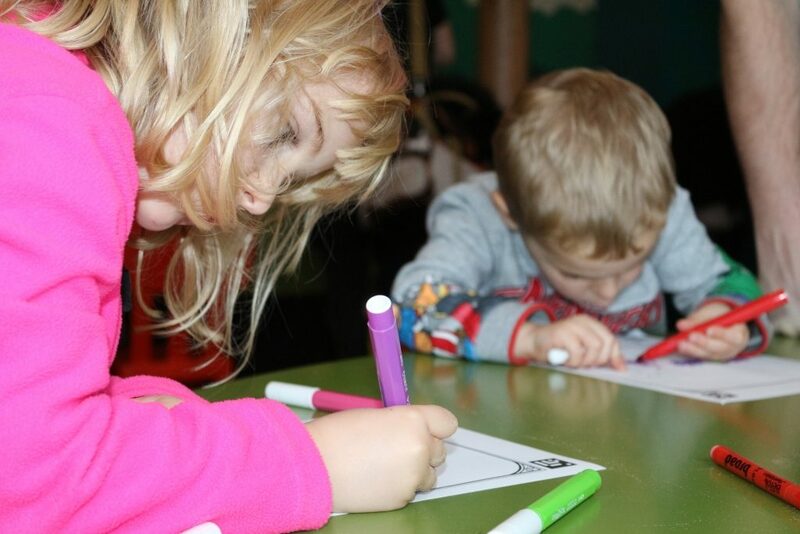 The create-a-dinosaur bit was good fun and the kids had a couple of goes colouring in their dinosaurs and watching them on the big screen. 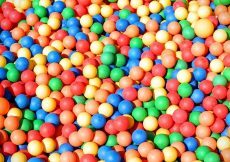 They enjoyed the big soft play (although not the huge balls!). 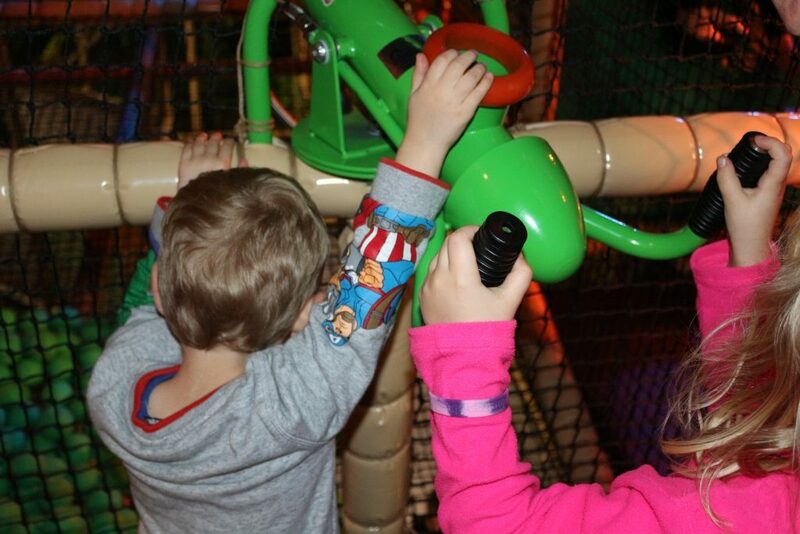 It was clean and extensive and offered slightly more than an average soft play with mirrors and the shooting range. They would happily have spent the whole time on the go-karts. 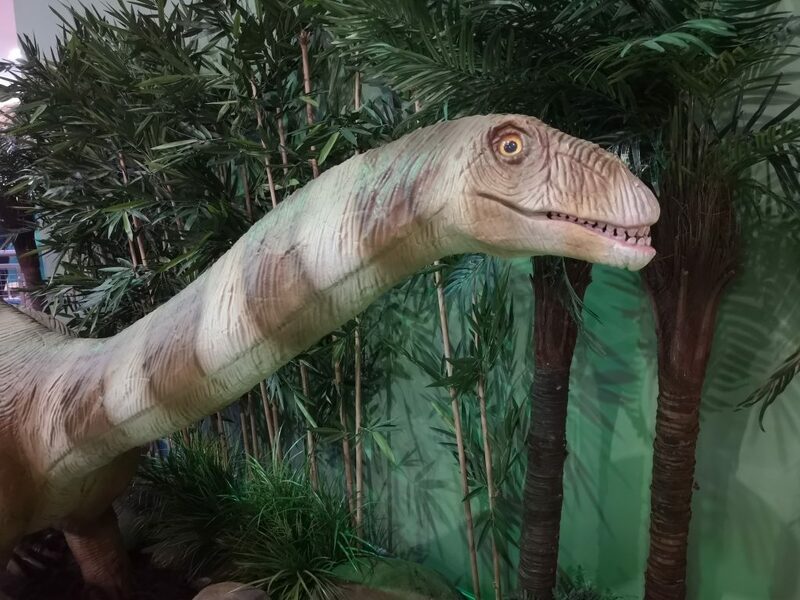 The animatronic dinosaurs are impressive, and I happen to know after a slightly drunken Google once that they are definitely not cheap, however they have only been in situ a week or so and sadly are already showing signs of wear and tear to their foam bodies. She doesn’t smile for pictures these days… And chose her own outfit. Love her. 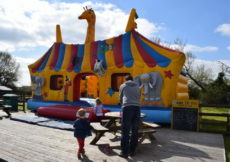 Without any kind of fencing or even a sign warning people to keep off, and no staff overseeing them, there were children grabbing at the dinosaurs and swinging from the tails, while their parents looked on and some even encouraged them. Unless something changes, the attraction will not last long in its current state and will become very tired quickly. Price-wise, I was shocked to find out how expensive entry to Dinotropolis was. 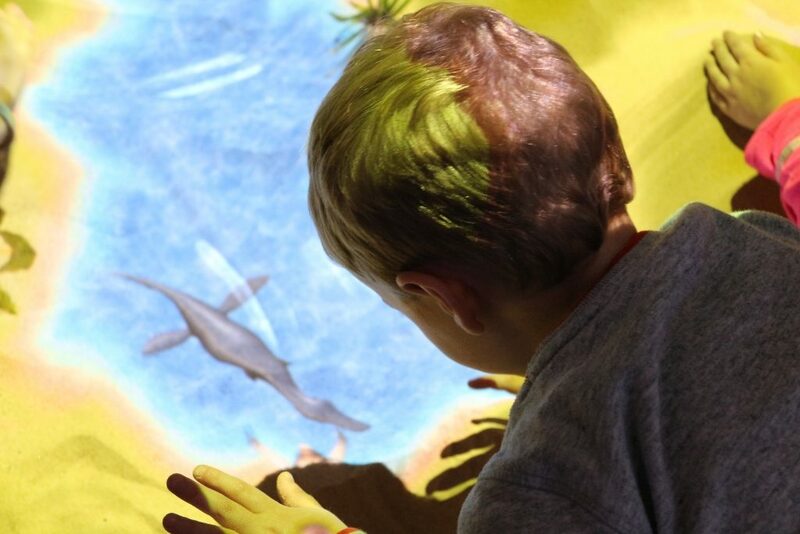 A ticket to Dinotropolis Bluewater costs £12 for any child over one. Even if they can’t walk yet, you have to pay the same for a toddler as a six or a seven year old which is mad. It costs £15 if they want to do the escape room, which I wouldn’t pay extra for. £20 and you get a lunch box included, although you don’t get extra time allocated for this. The worst bit in my eyes is that there is a charge for adults. 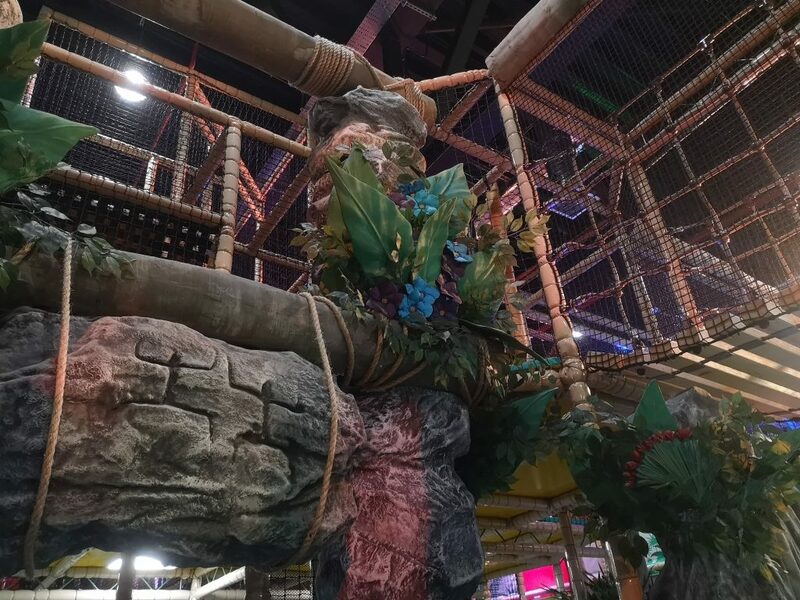 I must say, through principle I would never pay to get into a soft play centre, which is essentially what this place is – it sells itself as an ‘adventure park’ and there are other things there, but if you asked my children they’d definitely say they went to soft play today. I don’t particularly want to be there, I am not going to use the equipment, it puts my back up from the off. 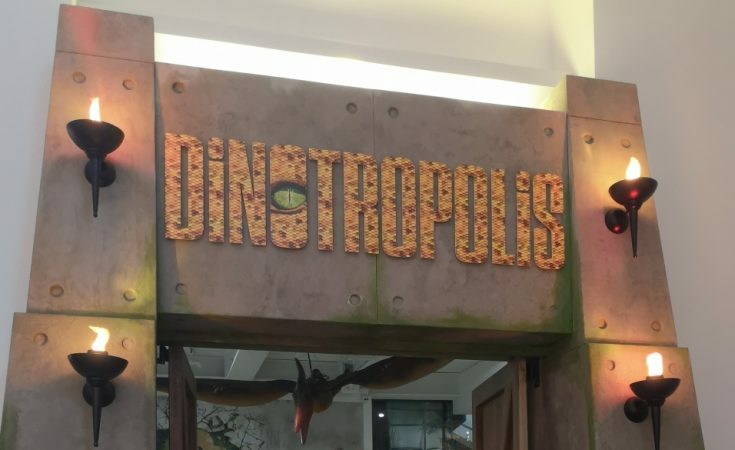 At Bluewater’s Dinotropolis an adult ticket costs and eyewatering £5. £5! 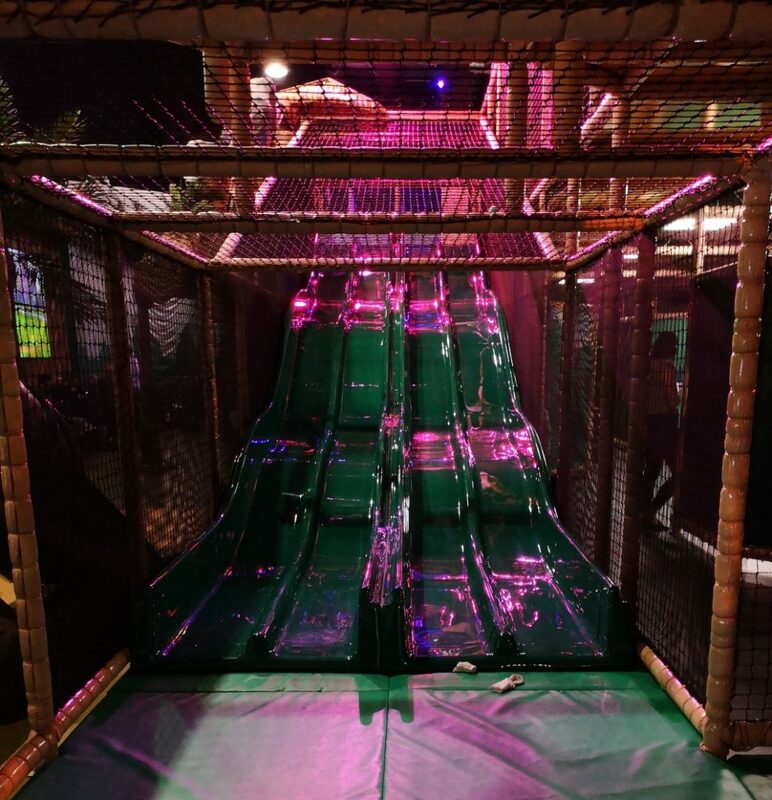 To suffer other people’s kids walking up the slides towards you! Mercy. When we went there wasn’t anywhere to put things aside from shoe slots, so nowhere to keep bags, etc – and there wasn’t even anywhere free to sit down. As an adult, I have to admit, it was a bit of miserable experience. We were there for two hours, although I’ve since learned on the website that a Dinotropolis session is meant to be an hour and a half. That just isn’t long enough, especially if you want to use the cafe as you’re unlikely to be able to queue and get your food much within half an hour let alone eat it. If I was booking, I’d avoid mealtimes and go to one of the many restaurants inside Bluewater instead. Having been on the go all day and not eaten when we arrived, I ordered some humous with crudites and pitta bread which initially came without any pitta bread. It was, I’m afraid to say, utterly disappointing for the £4.95 paid. Personally, I think the entrance fee is way too expensive, especially considering the length of time you can spend there. If you want a great Dino experience and you don’t mind the open air, check out Paradise Wildlife Park in Broxbourne, Hertfordshire or Wingham Wildlife Park, Canterbury; both under an hour from Bluewater in opposite directions and with indoor soft play and a whole day’s worth of family fun. That said, the children really enjoyed it. 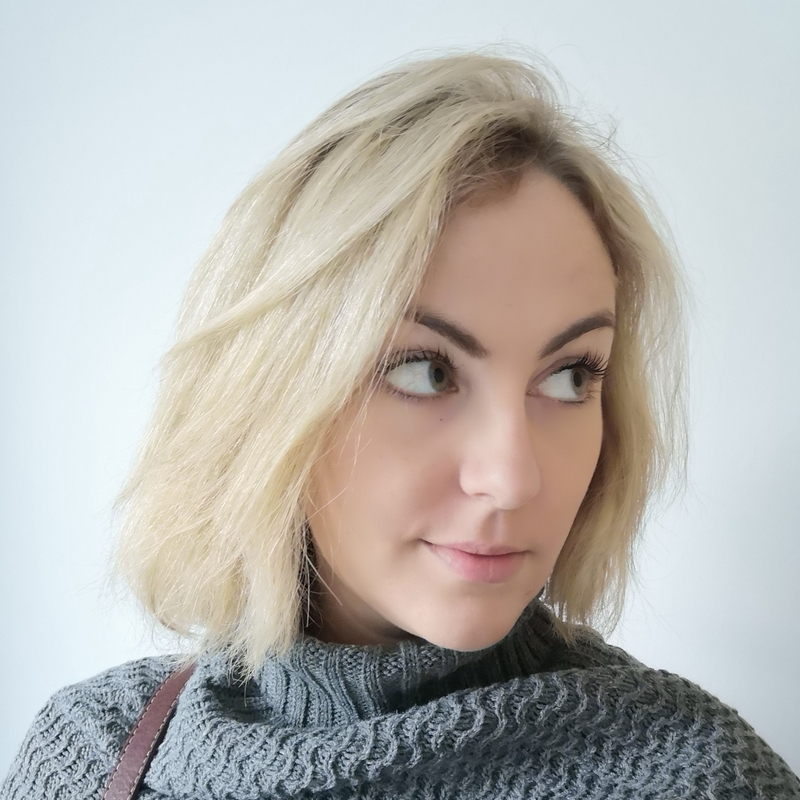 If you are Christmas shopping with the family and have the option to drop off your husband and kids for an hour and a half then I can see that it could be a better option than dragging them about the shops. Everyone will have a much better time of it. However it’s just a bit expensive for what it is, really. We got free entry in return for this review however this hasn’t affected my opinion and all words and pictures are my own. 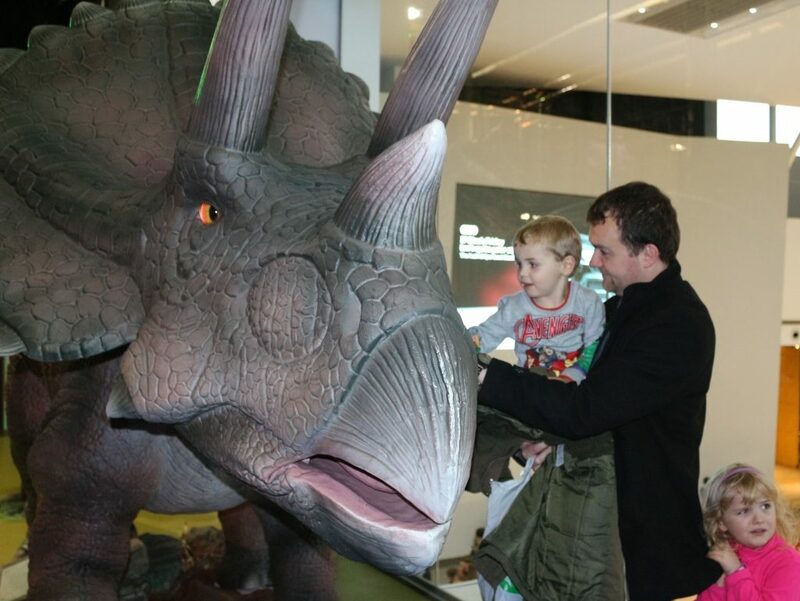 For more information on Dinotropolis at Bluewater, and to book tickets, head to their website.